India has the world’s second-largest TV viewing population, yet for a long time, brands and broadcasters had to depend on household sample data to understand how viewers watched their TV shows and channels. Moreover, broadcasters cannot directly promote their shows on competitor TV channels. 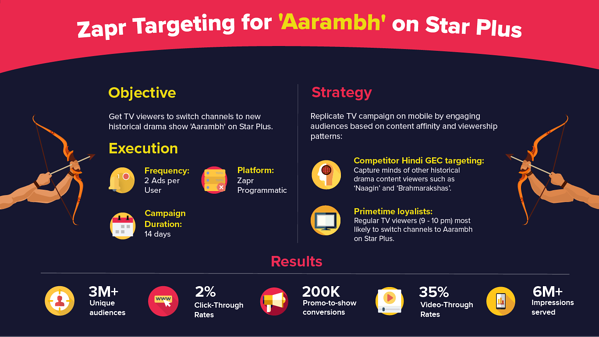 As demonstrated in this campaign with Star India, Zapr’s TV-to-Mobile Audience Platform allows broadcasters to engage competitor audiences and genre loyalists right on their mobiles and track the result back to channel viewership. Star Plus, a leading Hindi Television broadcaster took three strategic primetime bets in 2017 and tapped into some of the hottest trends in Indian entertainment industry - comedy, historical drama, and dance reality. The channel launched three shows and wanted to capture maximum share of primetime audiences on TV, and ultimately convert them to Star Plus viewers. To meet this challenge, Star India leveraged Zapr Media Labs - the world’s largest media consumption repository, and India’s only platform for individual-level TV consumption and Mobile targeting. Across 3 campaigns, Star Plus wanted to target TV audiences on Mobile and CONVERT them into actual show viewers across few weeks after the campaign started - driving eyeballs away from competition and giving Star Plus a clear edge in the battle of Indian Primetime television! Primetime loyalists: People who regularly watched Hindi channels across news, general entertainment, music and movies in the very same primetime slots (eg. 8 - 9 PM) when Star’s newly launched shows would air on TV. Since these viewers were more likely to switch channels across Hindi content, Star Plus had to ensure awareness among these timeslot loyalists. Genre enthusiasts who watch competitor show: Star wanted to grab maximum awareness among people who tune into rival shows in the same niches such as reality TV, comedy, and historical drama. Using our audio fingerprinting technology, ad-tech, and proprietary algorithms, we would Identify and engage target audiences few weeks before the show launch to ensure interested individuals actually CONVERTED on broadcast TV. Star’s promo strategy would achieve precise Mobile-to-TV conversion rates as high as 8%, something which hardly any marketing agency can do for a broadcaster. Across three campaigns, Zapr identified 7.8 million unique users who fit into Star’s TV-to-Mobile campaigns. Using in-house ad technology, we programmatically executed second-screen advertising that replicated a TV campaign on mobile. Users were engaged with promo videos on any app they used anywhere on the mobile ecosystem. Zapr ensured fixed frequency caps with not more than 2 ads shown to a user giving just the right amount of awareness. Zapr achieved 100% engagement with identified target segments securing zero spillover of Star’s digital budgets. 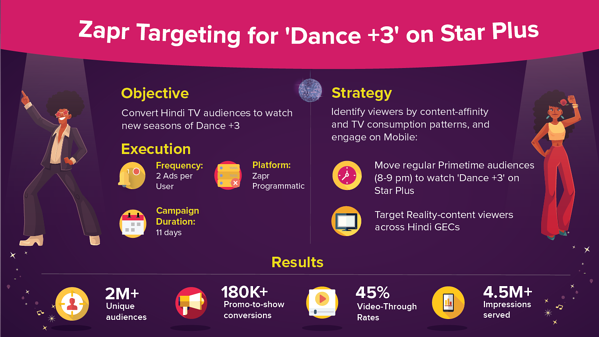 For the season premiere of dance reality show ‘Dance +3’, Zapr targeted audiences in the ‘Hindi reality-content’ pie which has the largest following across Indian television, and primetime loyalists. For the launch of its new historical drama show ‘Aarambh’, Zapr engaged viewers of 2 majorly followed shows in the same historical-drama genre aired on competitor channels. 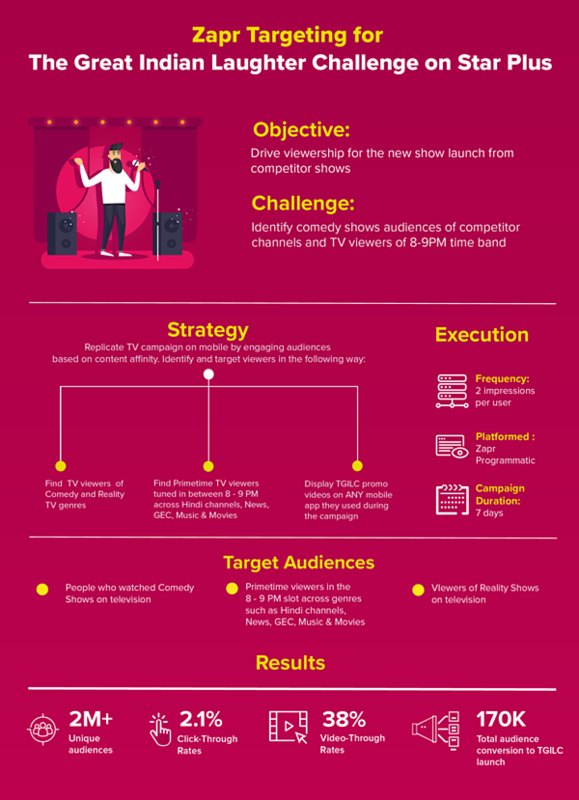 For the new season launch of stand-up comedy show ‘The Great Indian Laughter Challenge’, Zapr engaged viewers of rival Comedy-Reality TV shows and primetime loyalists. 6% - 8% Promo-to-Show conversion rates revealing the impact of the cross-screen campaign. Higher share-of-mind and hence, share of eyeballs and share of wallet from competition.